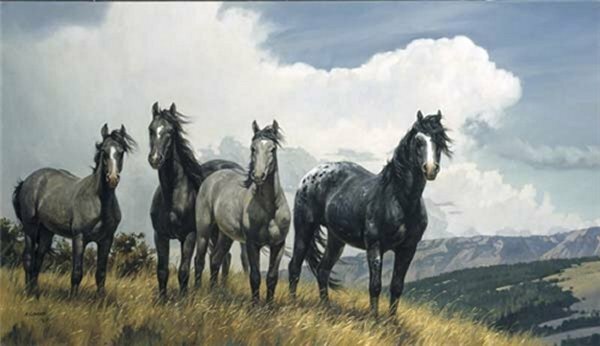 Amazing Grays IV by Nancy Glazier ~ This painting centers around the Appaloosa stallion with a coat that splashes gray over a mottled white background. The Amazing Grays series is the most popular ever created by the artist. Each release has enjoyed an immediate sell out. Last year's Amazing Grays III sold out within 3 weeks. Nancy Glazier is passionate about her art and the subject of her art. This passion is evident in the way she paints and the way she lives – they are inseparable. Many of the artist’s admirers and collectors consider Glazier to be an extraordinary artist whose paintings seem “alive.” For her, this is warm praise, because she desires to share what she experiences through her paintings. She hopes the viewer, too, will feel the warmth of the sun or the crisp chill of winter, smell the sage and dust, or hear the bellow of the bison. Glazier knew she wanted to be an artist from early childhood. In her teens, she lived in Wyoming where she immersed herself in the rugged, western terrain. There she was mentored and taught by artist Adolph Spohr, who gave her private instruction and taught her how a professional uses paint and brush…how to observe and self-correct. The artist’s style evolved over time. After seeing a dramatic photograph of a grizzly, she was awakened to a desire to paint animals “close up and hair-by-hair.” The artist has taken hands-on anatomy classes that enable her to paint an amazingly accurate portrait of an animal from its bone structure to muscles to hair, bringing it life on her canvas. The artist enjoys much success as one of today’s most talented wildlife painters. Her original works are represented by one of America’s leading galleries. Her paintings have been featured at prestigious shows throughout the country, and two of her works hang in the Museum of Church History and Art in Salt Lake City.